Fresh Ghost Pepper Pods - Commonly referred to as the Fresh Bhut Jolokia Pepper Pods are one of the originals that helped kick off the super hot craze. These Fresh Bhut Jolokia Pepper Pods pack blistering heat and a delightful earthy, slightly sweet, slightly smokey flavor that is very unique compared to the Trinidad varieties of super hots. It's easy to see why Fresh Bhut Jolokia Pepper Pods and Fresh Ghost Pepper Pods are already considered classics. 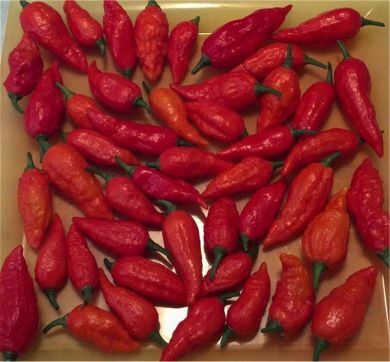 We will Have Fresh Bhut Jolokia, Fresh Ghost Pepper Pods, Fresh Bhut Jolokia Yellow CARDI, Fresh Chocolate Bhut Jolokia, Fresh Red Bhut Jolokia, Fresh Red Ghost Peppers, Fresh Naga Bhut Jolokia and many more Fresh Bhut Jolokia Varieties for you to choose from.